Frédéric Baudron, senior tropical systems agronomist at the International Maize and Wheat Improvement Center (CIMMYT) in Ethiopia, introduces himself and his work with the program. It is one of a series of portraits of key people in Africa RISING. I trained as a tropical agronomist, but specialized as a livestock scientist and started my carrier working for various development programs targeting the interface between people (mainly farmers) and wildlife. I then did a PhD in plant production systems. My research interests include farming system research, sustainable intensification, impact of agriculture on biodiversity, and participatory innovation development. Currently, I am a senior scientist working for the International Maize and Wheat Improvement Center (CIMMYT) in Addis Ababa, Ethiopia where I lead a number of projects for CIMMYT including the Farm Mechanization and Conservation Agriculture for Sustainable Intensification (FACASI) project, which is implemented in Ethiopia, Kenya, Tanzania and Zimbabwe. 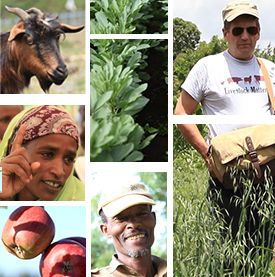 Developing a ‘proof of concept’ on the Ethiopian Highlands regarding farm power as a main limiting factor to the productivity of these systems (as, or more important than germplasms, nutrients and water) and how this can be addressed by small mechanization. To me, the biggest challenge of Africa RISING is in creating the conditions for co-construction of innovations. Innovation platforms ensure that local knowledge is taken into account, but mechanisms need to be put in place to ensure that the ‘creativity’ of researchers is not limited (is participatory and not ‘locked in’). Broadening the range of what is possible is a fundamental role of research. No other program I know of has such a systems perspective. Having 10 CGIAR centres working together is, I believe, a uniqueness of Africa RISING. Many CGIAR Research Programs (CRPs) have hardly managed to have more than two centres working together! Reaching a truly farm-scale and landscape-scale research approach, integrating the various component technologies tested in the first phase. Tags: africa rising, Frédéric Baudron, interview, mechanization, portrait, RISING voices. Bookmark the permalink.